So Sadly, after two nights, we left the comfy George and beautiful Rye to drive along the coast. First stop was Beachy Head—a bluff walk with views of chalk cliffs and, down below, a small red lighthouse. Buffeted by a warm breeze and a busload of German high school students, we were thrilled by the dramatic white cliffs and the churning blue-green sea. A few miles farther on, we came to Birling Gap and the Seven Sisters, and took a longer bluff walk there. The day was again perfect—sunny, breezy, with the scent of mown grass (or should we say grazed grass, because that’s how it was mowed). The land along the bluff undulates, each quarter mile hump a “sister,” so you walk up and then down, and then up, and then down--not for the short of breath or weak of knee. On the ups, you get stunning glimpses of the cliff edge and the vertical chalk white cliffs and the ocean, where the chalk gets churned up in the waves to produce floury, turquoise water. Okay. Words fail: the Sisters is one of the most beautiful places we have ever been. But we could hardly linger: we had two more stops before we’d sleep. This time, it was Apple Maps that led us far astray by taking us down ridiculously narrow lanes to the village of Litlington some 6 or 7 miles from our next destination, the Charleston Manor Trust. Not funny. 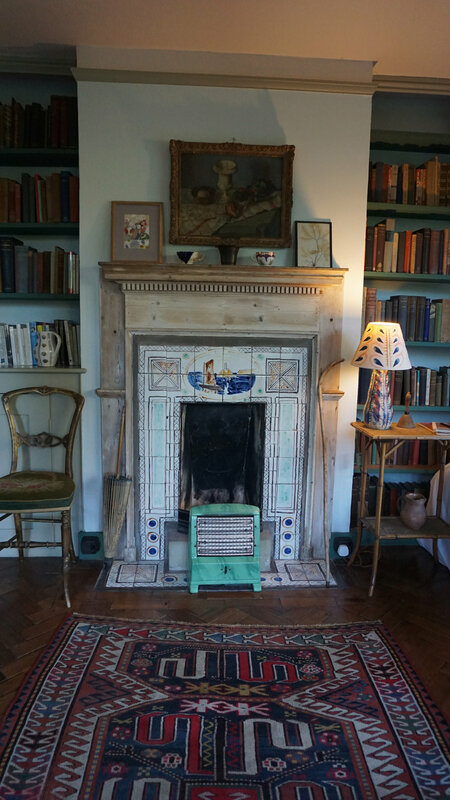 Charleston Manor was the home of Vanessa Bell; her best friend, lover (briefly), and lifetime artistic collaborator, the painter Duncan Grant; and also, her husband, the critic Clive Bell. As with the Nicholson/Sackville-West’s, love and sexuality were very fluid among this faction (and most) of the Bloomsbury group. Both Duncan Grant and Clive Bell had affairs with other men, and both fathered children with Vanessa. Artistically, the Duncan/Vanessa alliance was prodigious: both painted paintings, but they also painted their tables and chairs, their beds and cabinets and walls and chimney pieces; they designed upholstery fabric and ceramic tiles. Duncan Grant also designed needlepoint items--cushions, chair backs, fireplace screens—which his mother duly executed. (The several museum-quality pieces in the house, they left alone.) Frequent visitors included the Woolfs (from nearby Rodmell) and John Maynard Keynes, the famous economist. Sadly and frustratingly for us, no photographs were allowed inside the house and studio. None. Still, the whimsy and vitality of the Grant/Bell productions, the effusion of color and playfulness of the designs were a joy to see, however fleetingly. Why aren’t we all painting our dining room tables, our mantels and headboards, our dresser drawers? Here are some pictures of the outside. 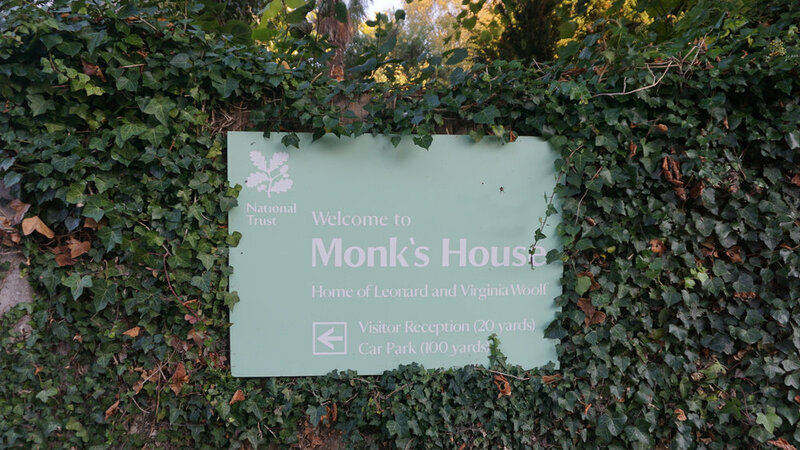 We could not linger at Charleston (and so avoided spending a king’s ransom at the tantalizing gift shop) as we had only an hour and a half to reach and tour Monk’s House, the Sussex country home of Virginia and Leonard Woolf. GPS delivered us there smoothly, in plenty of time to tour the downstairs—and see in real life the green sitting room that inspired our green living room in Altadena. 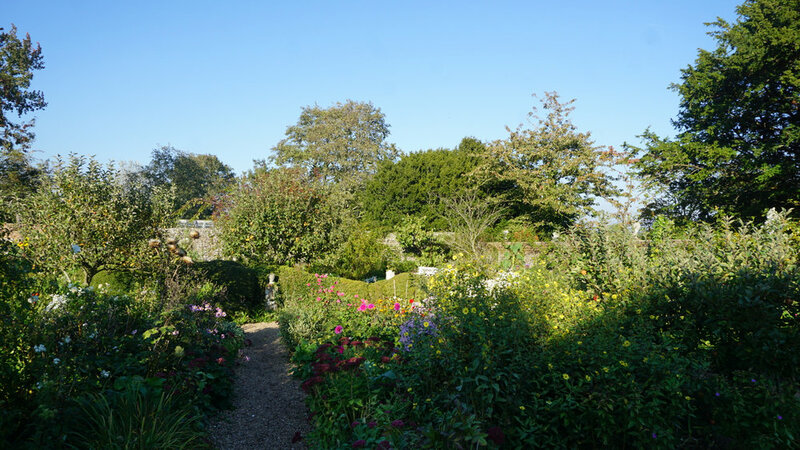 The Woolfs bought the place in 1919, mostly for the generous garden, and the way it opened onto the meadows of the South Downs. The house itself was modest and dank, with small rooms and no electricity or indoor plumbing. Renovations followed, with comforts increasing with the sales of each book. Leonard took over the garden, and Virginia enlisted her sister Vanessa and Duncan Grant to help with the decorating, so the house is full of their paintings, fabrics, tiles, painted furniture. The dining chairs have needlepointed backs designed by Duncan Bell—his mother, apparently cowed by the size of the project, enlisted help in making them—visiting guests were set to work. (There are also numerous paintings by Trekkie Parsons, the younger woman who kept Leonard company for the rest of his life after Virginia died. That is, Trekkie spent the weekends with Leonard at Monk House and the weekdays with her husband in London: yet another Bloomsbury triangle). 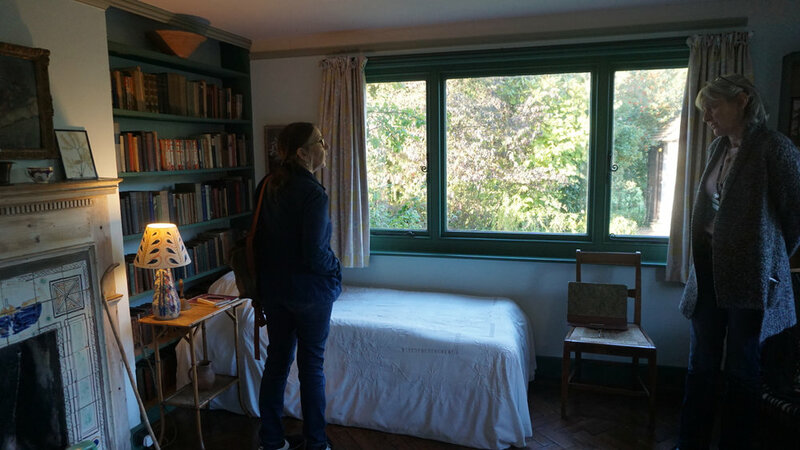 We did see Virginia Woolf’s bedroom, a first floor extension added in 1929, with its own outside entrance. 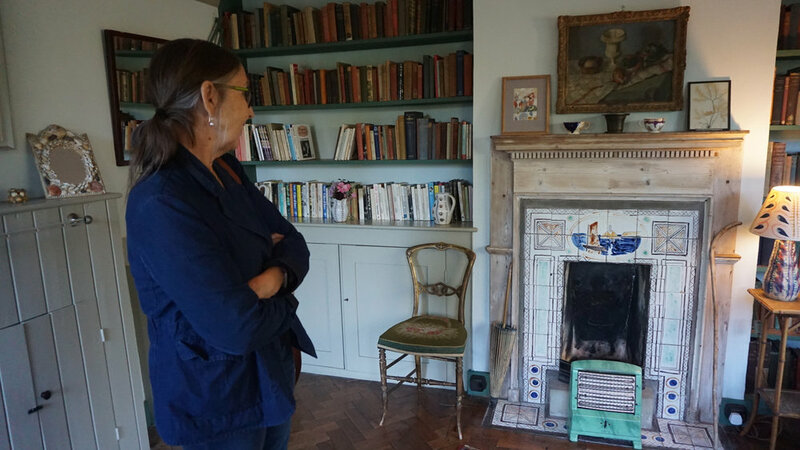 A booklined room with doors opening onto the garden, it has fireplace tiles by her sister Vanessa, and paintings by Grant. A narrow little bed. (She and Leonard always had separate bedrooms). Leonard wrote that his wife was “an untidy liver…her room tended to become not merely untidy but squalid.” In fact, the National Trust’s guide says that the Woolfs kept a messy house, with books and newspapers and magazines scattered over the tables, chairs, floors, and stairs, and pet food bowls everywhere. 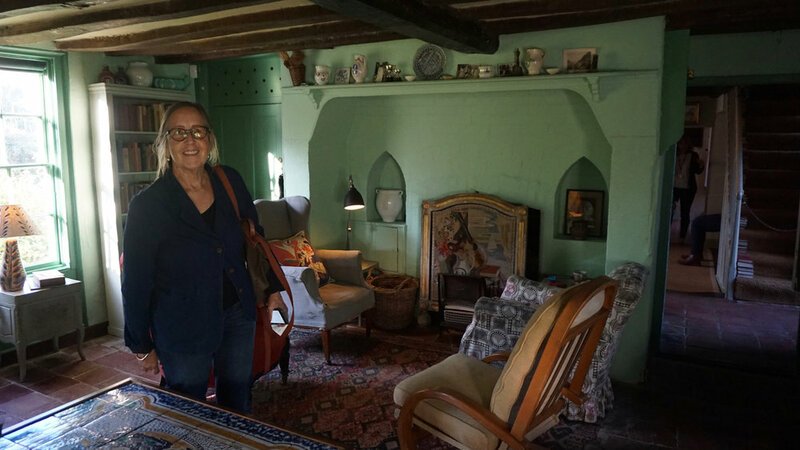 Virginia Woolf’s writing shed—the last of their renovations, built in 1929--sits far back in the garden and has a wide-open view over the meadows to far inland cliffs. 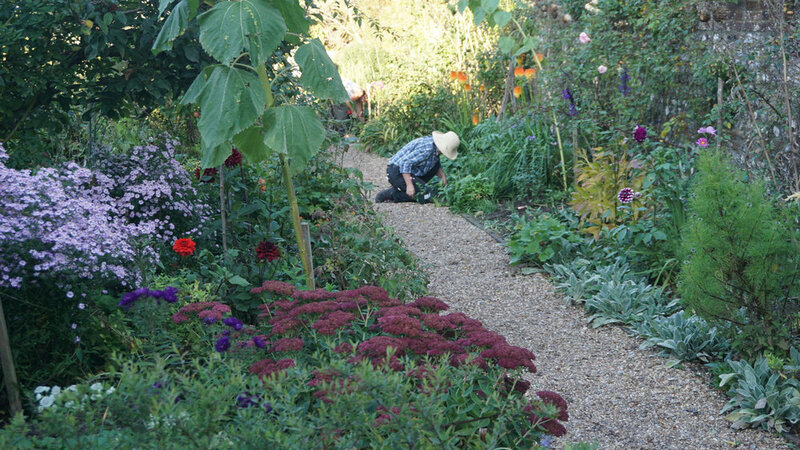 The garden—Leonard’s lifelong project—has many rooms and aspects; all of it, in splendid autumnal untidiness and decline. GPS was not finished with us: it led us on our wildest goose chase yet. We’d booked a room (with points) in The Buxted Park Hotel. When our GPS guide with the proper English accent announced, “Arrived,” we were up a dirt driveway amid pastures at an active construction site. A couple on a tractor were highly amused, and redirected us to our actual destination, yet another ridiculously sprawling repurposed English pile. Shabby at the edges, a little smelly in the halls (bug spray, Michelle diagnosed), the Buxted eventually won us over with misty views of its Sussex parkland, comfortable bed, restored public spaces, and excellent breakfast (included). The only way such massive houses could ever function was with enormous staffs of extremely low-paid workers. Today, even when transformed into going business concerns, it’s clear that these big deliquescing behemoths are almost impossible to keep up, and could easily absorb whatever profit the present owners manage to eke from them. In the morning, another shining, warm autumn day, we set forth for Oxford.